This picture I took the same day as in previous post. Some of you were wondering about the time of year and the weather. Both images are from November 1st. But temperatures are not quite different today the 24th. Let me see, 20º C. Forecast for tomorrow, sunny and 22ºC. Beach volleyball is not one of my favorites but I enjoyed the game for a while. Nice for practising sports photography. Very nice shot! People in motion! the beach, the players...:) very nice to see it in the Friday night. Yes, I love the action in this shot. 'Beach culture' is certainly something Barcelonans (?) 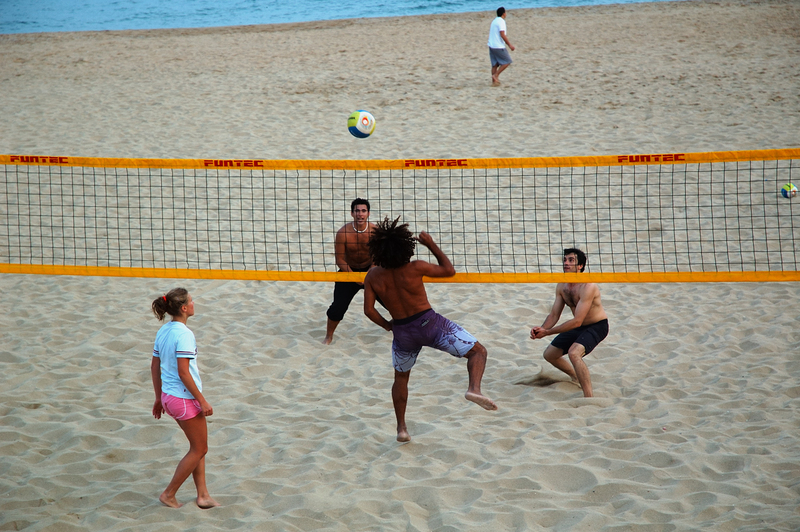 and Sydney-siders share, But we don't have much beach volleyball - not like I saw all along the beaches at Barca. ben agafat el moviment, qui ho diria...novembre a la platja. So who won the volley? The orange net, the postures of players in action, and the guy's wild hair all work together to make this a really fun snap! Yah, Sally, beach culture is what I want--makes no difference that I'm too "senior" to participate fully!!! its a wonderful photo...it was downloading slowly...and I expected girls in bikini after seeing the title..but I dont say I am disappointed because the photo is really great! Good shot. I'm a volleyball player, but live nowhere near a beach. Good timing on this one! 22 degrees. That's a lot. We've been having about 13 here but everyone is joking that with this global warming we'll be like Spain in a couple of years. Good action here. Amazing how yesterday's and today's shots convey a different feeling yet they were taken on the same day!! !